131 p., 14,8 x 20,5 cm. 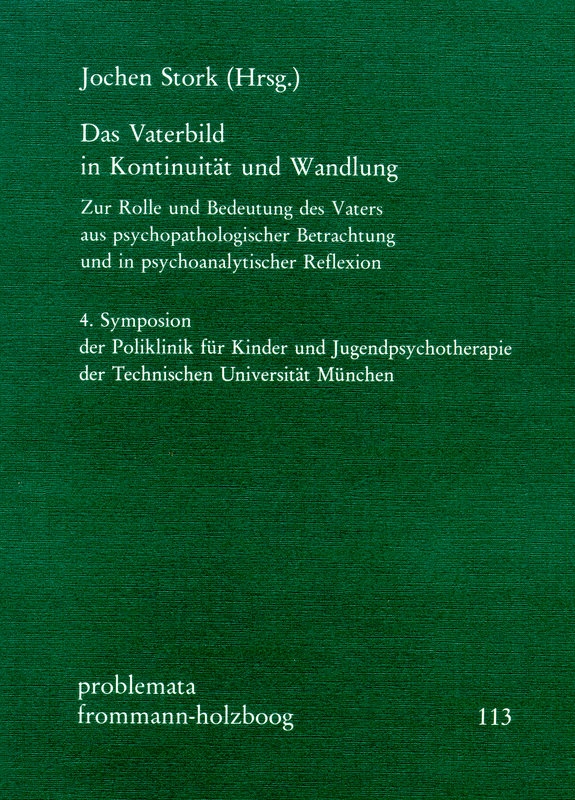 Zur Rolle und Bedeutung des Vaters aus psychopathologischer Betrachtung und in psychoanalytischer Reflexion. 4. Symposion der Poliklinik für Kinder- und Jugendpsychotherapie der Technischen Universität München. With contributions by Ernest L. Abelin, J. Chasseguet-Smirgel, Bela Grunberger, Peter Kutter and Jochen Stork. The popularity and actuality of the »father« – be it the »repressive« father or the »new« fathers – challenges us to keep up the scientific discussion. The internationally acclaimed authors of this volume examine the role of the father and his importance in early infancy. The discussion centers on two questions: Does the father, alongside with the mother, have a structuring importance for psycho-sexual development? And if so, what is the psycho-dynamic function of the father and the father imago? The studies show that the father, due to his »otherness« vis-à-vis the mother, occupies a firm functional position right from the beginning. The concept of a two-dimensional mother-child-dyad therefore needs to be corrected: With the inclusion of the father, the development in early infancy must be considered three-dimensional. It also includes dialectic and conflicting processes form the very beginning, the center of which is form by the Oedipus complex. Jochen Stork: Der Vater – Störenfried oder Befreier? Jochen Stork: Anmerkungen zu Märchen und Mythen.